Forty-seven percent of Americans consider themselves to be spiritual, according to a new PRRI study. The degree to which Americans consider themselves to be spiritual may impact their overall wellbeing and feelings of satisfaction with their lives. Anew studyreleased Monday by Public Religion Research Institute in partnership with Florida State University found that Americans who identify as spiritual report higher levels of “life satisfaction,” gratitude and pro-social behavior than those who do not. The survey, conducted between February 28 and March 29, also measured for religiosity based on how often participants attended formal worship services and the degree to which they said religion is important in their lives. The report identified four primary groups of Americans: those who are spiritual and religious; spiritual but not religious; not spiritual but religious; and neither spiritual nor religious. PRRI found that Americans who identify as spiritual and religious or spiritual but not religious express higher life satisfaction than those who are not spiritual. Sixty-one percent of spiritual but not religious Americans and 70 percent of those who are both spiritual and religious report being very or completely satisfied with their lives in general. In contrast, 53 percent of Americans who are not spiritual but religious and 47 percent of those who are neither spiritual nor religious say the same. A similar divide held true when participants were asked to rate their feelings about their health. PRRI found that 53 percent of Americans who are spiritual and religious and 50 percent of those who are spiritual but not religious say they are very or completely satisfied with their personal health. Just 42 percent of Americans who are not spiritual but religious and 37 percent of those who aren’t spiritual or religious report being satisfied with their health. Spiritual respondents also reported spending more time with friends, feeling more gratitude and being more open to doing favors for others than those who are not spiritual. PRRI also found that a greater percentage of spiritual Americans report feeling inspired while consuming various forms of media than those who aren’t spiritual. The greatest source of such inspiration for both groups was music. Seventy-one percent of spiritual respondents said they felt moved or inspired within the previous week while listening to music. Just 43 percent of nonspiritual Americans reported having the same experience within the week prior to the survey. The relationship between spirituality and happiness has long been a topic of interest among researchers, who generally find thatfaith promotes life satisfactionby binding people together around a shared or common belief and helping them develop a sense of personal meaning. That could explain why PRRI’s study showed that Americans who are religious but not particularly spiritual are less likely to express life satisfaction than those whose faith is fortified by spiritual experiences like feeling connecting to the world around them and feeling a sense of meaning in life. Clay Routledge, a North Dakota State University psychology professor who studies the relationship between faith and human beings’ search for meaning, said religious affiliation doesn’t necessarily guarantee wellbeing. 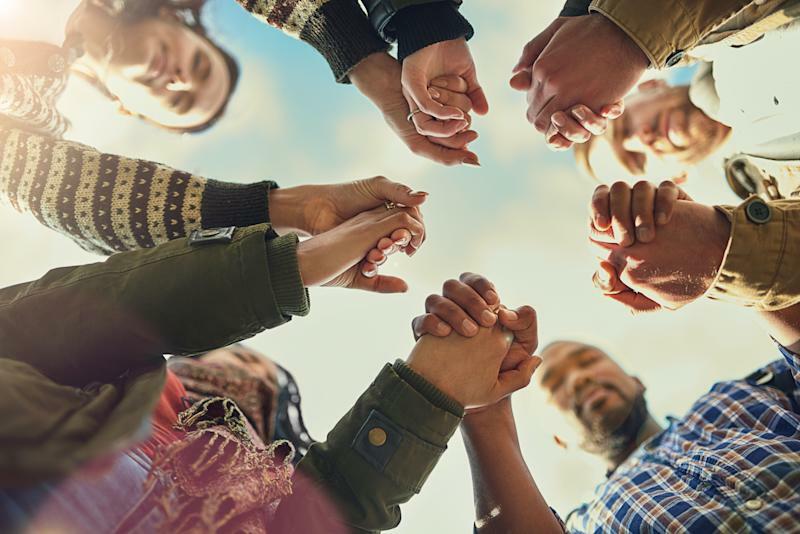 “Religiosity has long been connected to wellbeing but simply having a religious identity is not necessarily diagnostic of the deeper sense of spirituality that makes one feel meaningful,” Routledge told HuffPost. Religious affiliation also doesn’t ensure that a person feels particularly connected to the faith with which they identify, he added.